We are the #1 partner for EV operations. Manage all your vehicles and chargers from one platform. 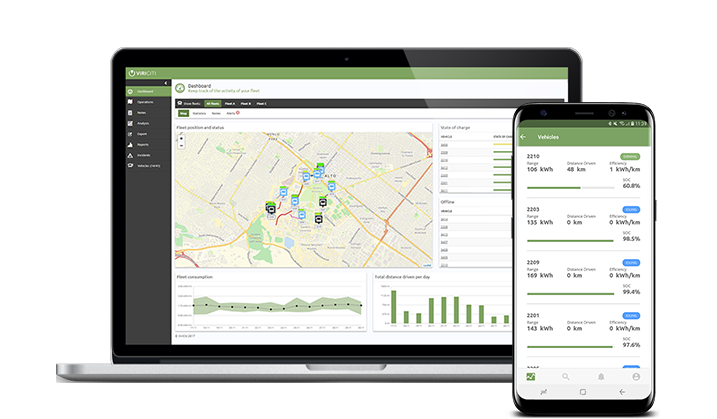 After the DataHub is installed inside your vehicle, we display real-time data and historical data to assist in all aspects of your electric operation. Real-time data will improve reliability of your operation and punctuality of your services. Historical data shows efficiency of vehicles, routes and driver behavior to optimize your planning. This way, you will be able to reduce the total cost of ownership. Real-time monitoring of your charge stations will guarantee you full transparency. By being aware of status, charging rate and technical errors, your vehicles are always charged on time. Receive active warnings when chargers aren’t working and remotely control their status. Available as additional package. See below. Lower peak charges, avoid costly grid connections. Avoid peak loads and time periods in your depot. Save money on grid connections and utilities while ensuring all your vehicles are charged on time. Smart charging only available with Basic charge station package.